Recent questions I’ve received about infant toys and play gave me an idea. Shana, the mother of a 9 month old, expressed concern that her boy’s occupation with books and “cruising” might not be “enough”, and asked if I could give “examples of what happens in your classes with this age group.” So, I made this video tour of our play space at RIE (Resources for Infant Educarers), where infants and toddlers, 3 months to 2 years old are fully absorbed in independent play each week. Safety first. Infants and toddlers need gated-in areas so that they can play safely and feel free to explore without interruptions. We can put our minds at ease (and even go to the bathroom on our own, imagine!) when our baby is left to enjoy a safe and secure place. As a substitute for the baby sofa you see here, use an inflatable wading pool (granted, easier to find in the summer than the winter) and line it with a blanket and a couple of firm pillows. Infants 2-3 months of age and younger don’t need toys. They usually aren’t able to grasp yet, and are absorbed with examining their miraculous hands. 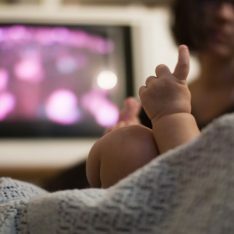 Instead of showing your baby new toys, wait, and allow the toys to be discovered. This play space is much bigger and busier than necessary for a home setting. I was trying to include as many open-ended toy examples as possible. 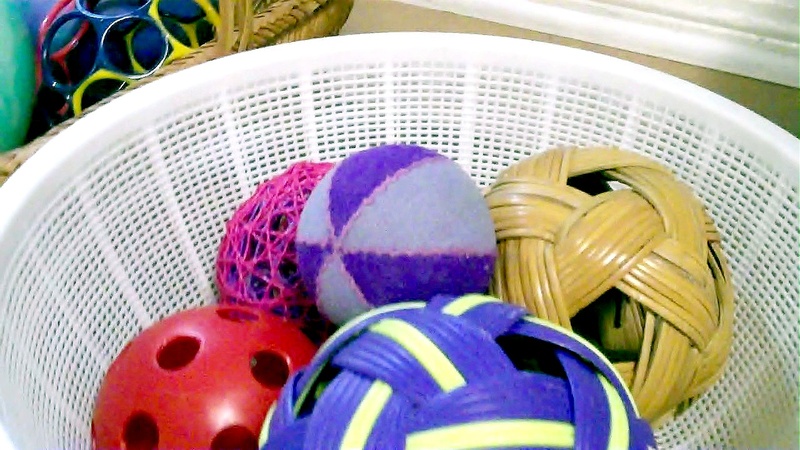 This is just a small sampling of the types of objects that infants enjoy exploring. I’m hoping parents, RIE enthusiasts, child care professionals, and others who read here will share their favorite ‘play object’ ideas. In all the years I’ve observed infants and toddlers, I’m still surprised each week by the creative new uses they find for objects in their environment. I never tire of watching babies explore. Create a space for your baby and prepare to enjoy! The simplicity of the toys is impressive. I love it!! Thanks for this video and the other ones you’ve posted recently. Since I’ve never seen a RIE classroom or daycare, it’s helpful to see the children and their playspace instead of just read about it. This is so helpful! Thank you Janet! Really, it doesn’t look too exciting, but my son does nothing but squeal and babble during his playtime with not much more. I’m amazed! Thanks, Shana! You bring up a really good point…there is a vast difference between our perception of what’s interesting and a baby’s. But our babies can make the world new and intriguing for us again, too, if we allow them. These are the only toys in the class for up to 2 years? Do you ever introduce anything like a play kitchen, with cabinets and things like that? My son has developed an obsession with opening and closing, and things that are hidden. Anything and everything remotely related to “peekaboo” We have a few containers, the just empties them out and goes about his way. But we use a play kitchen and he can open and close cabinets for a long time. We got him a play home (long before discovering RIE), with a door, window and mailbox, he recently discovered it and sits and opens and closes those all day. I’m wondering if the are in line with RIE philosophy. Of course, I didn’t put any batteries in the toys so they don’t play music or sounds, or light up. This is just a sampling of the toys we use. We have a couple of larger climbing pieces for the older toddlers. 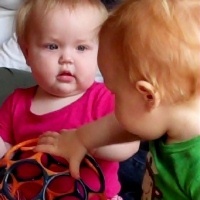 You can see one them in my post: A Lesson From Babies…It’s Okay To Struggle. Play kitchens and houses are wonderful and totally in line with the RIE philosophy. I had a kitchen at home for my children and (just like your boy) they got a lot of use out it. It was the plastic “Little Tykes” kind rather than the simpler, more esthetically pleasing wooden ones and we eventually relegated it to the large sandbox outside, since that’s where most of the ‘cooking’ was happening. I didn’t show in the video that one of those large blocks has a round hole in the top large enough for one of the colanders to sit inside it. Sometimes children use that as an imaginary “sink”. They also like climbing on top of the blocks and crawling down through the hole. When I worked as a RIE teacher in an infant classroom, my favorite toys for babies about 3 months and on were just small, square pieces of cloth. We would set it up next to the infant to look at, and they would be engaged for the longest time just looking between the scarf and their hands or the baby next to them. 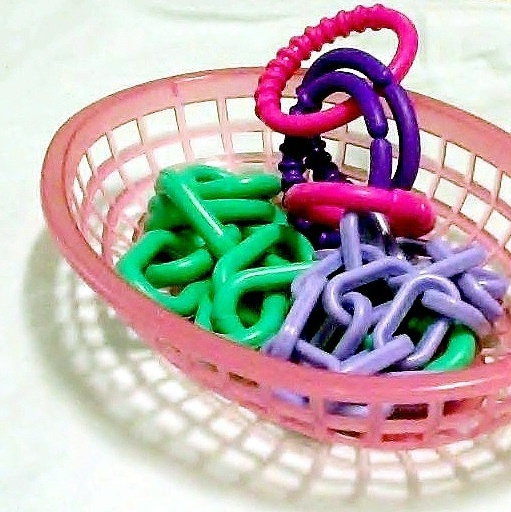 My favorite for the older babies were the stacking bowls–every one of them went through a phase where these were their favorite toys. Just simple little plastic bowls that you could stack up (and it was always fun to watch the older ones discover the art of stacking as well)! I can’t wait to share this with my daughter in law. They are expecting in a few weeks. I loved that there were NO commercial toys. A picture is worth a thousand words. The link for the RIE furniture does not seem to work…do you have an updated link? I’ve been reading through this blog all night and realized that I have been accidently doing a lot of things the “RIE way”, and toys is one area. We didn’t have much money when my daughter was born, so she didn’t have a single toy. For a while it wasn’t an issue, until she started grabbing at things. So then I just started letting her grab things around my house: wooden spoons, tupperware lids, a wire wisk. I did get a few wooden toys for her, and some playsilks, and I placed them in baskets in our play area. But the most interesting thing was a wooden ring stacker my mother in law gave her. “stacking” the rings seemed way beyond her play level at the time, since she was only 8 months old. But I figured it wasn’t a choking hazard, so I took it out of the packaging anyways and placed it on the bottom shelf of entertainment center; visible and reachable, but not really “in” the play area. One day, I placed her on the floor with a few items to play with while I made dinner and was surprised to see her crawl straight towards the ring stacker. She stared at it for a minute and then reached over and pulled the entire contraption towards her, tipped it over so the rings fell off, and began picking up various rings and tapping them against each other. Here I’d just put it there, thinking it wouldn’t see use for a year, but it’s now her favorite thing to play with, and without fail everytime I set her down to play, she heads right over and pulls it off the shelf and practices her fine motor skills and problem solving. On her own she figured out how to put her fingers in the holes she could hold on to 2 or even 3 rings in the same hand (at 8.5 months old). Question, where can I find those woven balls? Good question, Vanessa. You might want to check with the RIE office: 323.663.5330. I found some at Pier One Imports once. I was watching the short video with my almost one year old and she was ready to jump into the computer. As she looked at the different items on the screen she was making smiling and making happy noises. These are great ideas. Can you tell me the best toy/play things for toddlers? I’ve been following your resources for a while with my son who just turned two and our new baby girl who is 8 weeks. Though I will admit I didn’t follow very closely with our son who is quite spirited and has been quite challenging! But we are works in progress and I’m trying my hardest now to implement many of the RIE principles into our daily lives/routines. I’m wondering now if we made a mistake with his toys. He has been obsessed with trains for the last few months and loves to play with them and say choo choo (there is a train that passes our house a couple times a day and we would make the horn sound every time it passed). So we got him a train set and table. He hasn’t wanted to leave it – but now I’m wondering if it’s too directed as a play piece? Are train tables RIE? 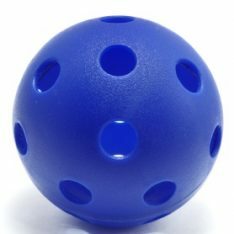 Should we have purchased such a concrete play toy? Hi Tasha – The train table sounds perfect! I would appreciate his focus and attention span and thank your lucky stars he is engaging so positively. And congratulations on your baby, too! 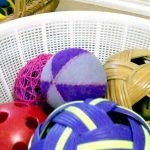 Great post on open ended and simple toys. I came here trying to see if I could find a link to the giant o ball in the video. My sister will be having her baby soon and I wanted to buy him a few r.i.e toys. I appreciate it!